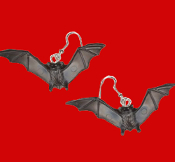 Funky Big Miniature Flying BLACK BAT EARRINGS - Halloween Twilight Goth Costume Jewelry - Dracula Symbol Scary Winged Charm. Cool classic gothic accessories for Halloween Party, Dark Shadows, True Blood or Vampire Diaries fan. Dimensional mini plastic charms approx. 1-inch (2.5cm) tall x 2-3/8-inch (5.94cm) wide.